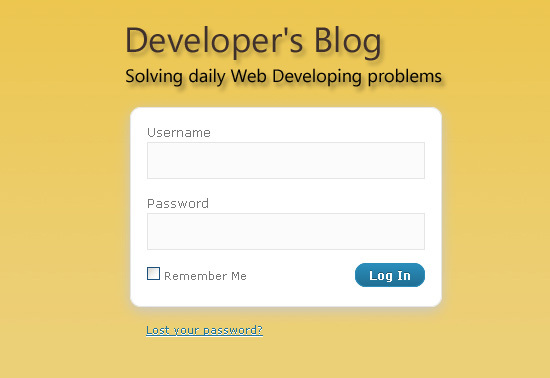 Do you want a Custom WordPress Login Screen? It is very easy, keep reading. 1. Create a new folder into your theme. NOTE: please notice the custom_login folder and the custom_login.css file in the code. I used one image (stored in this new folder we just created) and my own logo. I found this tutorial that uses FancyBox a couple of days ago. http://net.tutsplus.com/tutorials/wordpress/quick-tip-making-a-fancy-wordpress-register-form-from-scratch/. the wp-login page is always left out of the design scheme. Thanks for cleaning that up! The tutorial fron nettuts its great but pretty much harder. The Nettuts tutorial has been sitting on my browser for a couple of days. It is quite a bit of work; I am not quite ready to spend my time on it! Simple is usually the best practice. 4.789.740 post views so far. This page needed 49 queries to load.